Not everyone owns books. I won’t mention any names. I have a library full. Here are some that I think worthy of mention. No particular order. 14 March 2019: This eminently informative and thought-provoking reference is now available to download at no cost. Very generous of Mr Gilvary, the De Vere Society, and everyone else involved. See this post at the Shakespeare Oxford Fellowship’s website for additional details. I also tweeted about it. This excellent book doesn’t mention my name, but it doesn’t need to if your brain knows how to think for itself. If you believe that the overlaps between what of Italy is in Shakespeare, and where I went and what I did during my residence there in 1575-76, are unrelated and ignorable – while Willy never put so much as a toe in salt water – then thanks for stopping by, and have fun in Warwickshire or Washington. This isn’t one book, but a list of many that I used in my work – books that I owned or had private access to. Public access did not exist. Note in particular the list’s second section, Books that Shakespeare Read in Another Language. Indeed. Python is the second-best thing this realm has ever produced. SI was the first published work to connect my life with Shakespeare’s words, and to advocate the case for me as he. Looney (it’s LOW-nee, he was Manx) therefore holds pride of place in modern Oxfordianism. SI is not the smoothest read in terms of its style (oh those prolix Victorians), but it’s the book that opened the door to everything about me that has followed, including the website you’re now reading. The Centenary Edition has updated the original’s punctuation and formatting (though not its text), and editor Warren has added references and a bibliography for a great many of Looney’s sources. It’s a welcome alternative to the Internet Archive’s scans of the old book, though the scans win the advantage on cost, not having any. But spend the money if you can. Your eyes will thank you, and you can write in the margins. Dauntingly comprehensive study that brought my case up to date. Even dyed-in-the-wool Stratfordians can learn a lot about the Author from this book, and it’s a must-read for any more-than-casual Oxfordian. Worth the effort. More details are given in my post Oh Put Me In Thy Bookes. See also Oh Put Me In Thy Bookes, which discusses both the Looney and Ward books in greater detail. With pictures. Ignatius J Reilly is the nearest thing I’ve seen to a modern Falstaff. • My Bible – It belongs to me. I want it back. 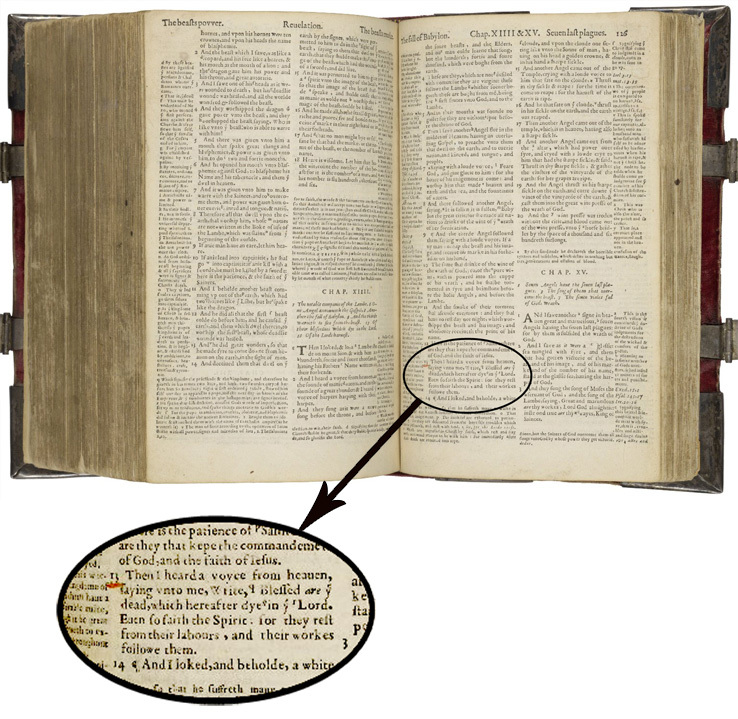 photos courtesy of the Folger Shakespeare Library I underlined Revelation 14:13 for a reason.